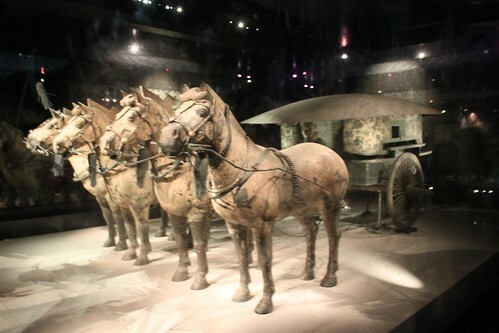 The well-known Terra-cotta Museum is located on the east side of the Mausoleum of Emperor QinShihuang, the first emperor in Chinese history. 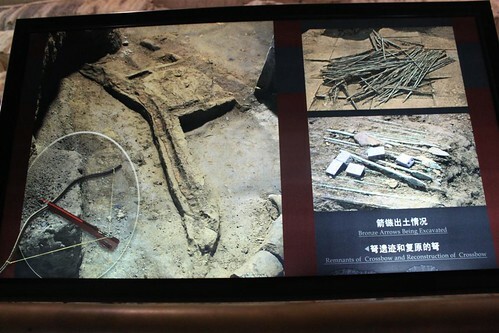 The Museum covers a total area of 20 hectares of Pit 1, Pit 2 and Pit 3. Pit No. 1 is a huge arch-domed steel structure located at the center of the museum with the area of 16,000 square meters. 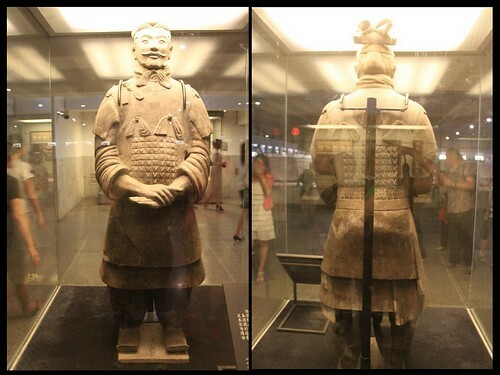 Pit 2 and Pit 3 built in Qin and Han Dynasty tomb mound style cover an area of 17,934 and 1,694 square meters respectively. On March 29th, 1974, local farmers of XiYang village, LingTong County, were drilling a series of wells in search of water during the drought season. They discovered some pottery fragments and ancient bronze weapons and immediately reported the news to the local government at once. 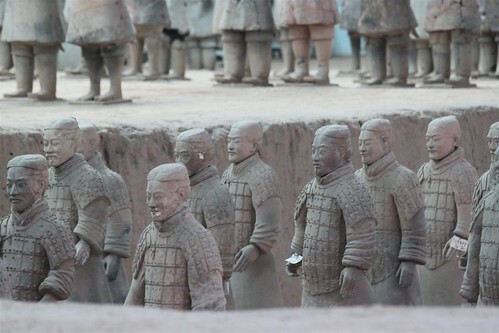 The news aroused much attention from both local Government and National Historical & Cultural Relics Administration. 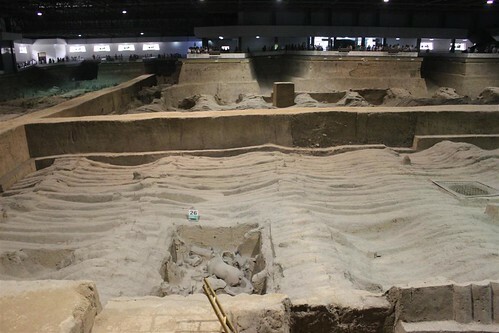 With government approval, an archaeological team from Shaanxi Province arrived at the site on July 17th, 1974 and began their explorations and excavations. 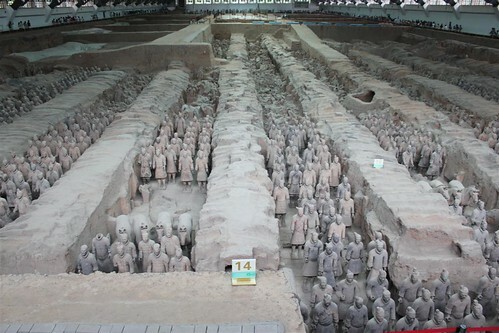 On October 1st 1979, Emperor QinShihuang's Terra-cotta Museum was opened to the public. The villagers were moved to a nearby housing area which was developed by the Government. 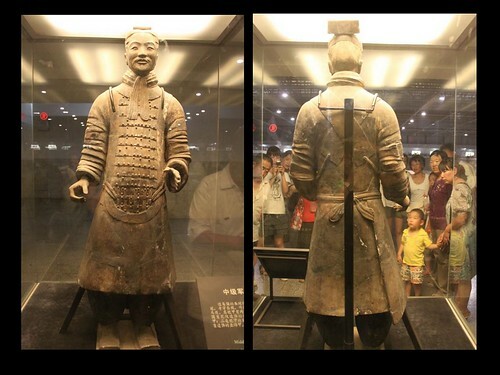 Emperor QinShihuang is the first emperor in Chinese history who unify the country by standardizing the system of weights and measures as well as the standard form of Chinese language in the country. 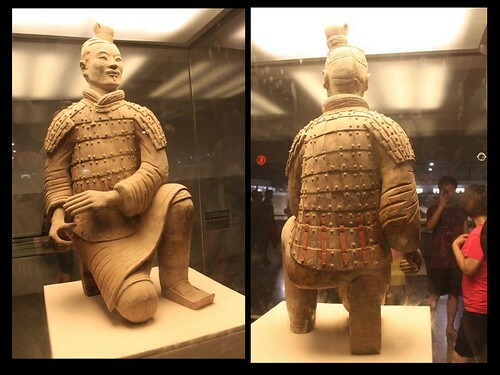 Emperor Qin died in 210 BC at 50 years old. The tomb was not complete when his body was buried within it. 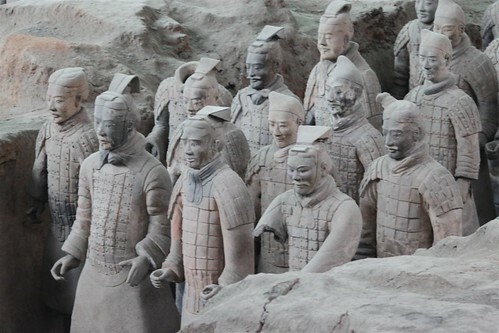 According to a decree of the Second Emperor, those of his father's ladies who had no children were ordered to follow the emperor to the grave. 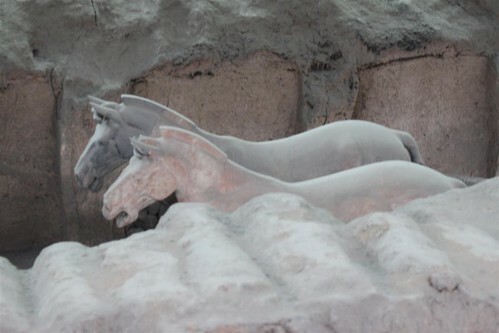 Many of the tomb builders were also buried alive. 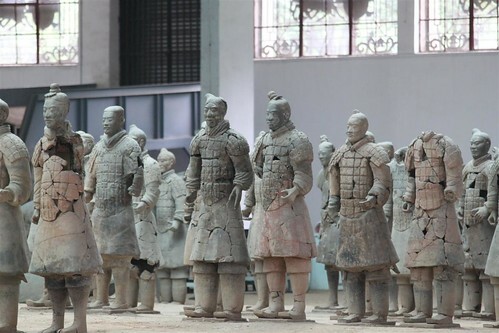 In the HanShu (Book of Han), the emperor's funeral was described as follows: "thousands of officials were killed and thousands of craftsmen were buried alive in order to keep the tomb secret." 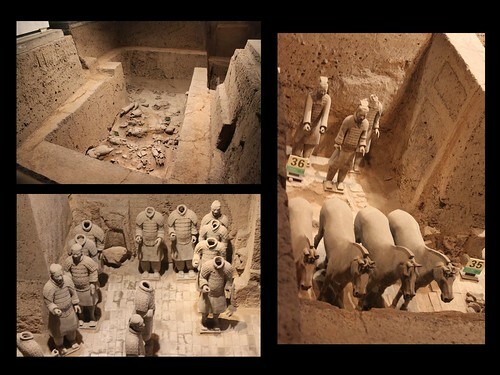 Emperor Qin believed that life under the ground after death was a continuation of life on earth. Therefore he constructed a huge mausoleum for himself. 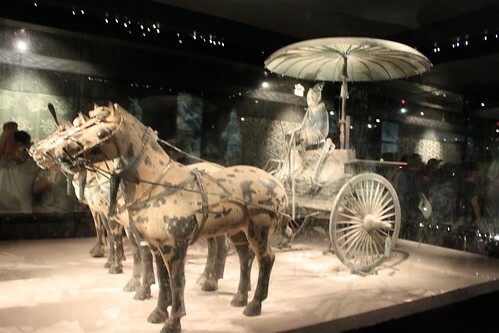 Today, the Terra-cotta Museum has become one of the "Eighth Wonder of the World" and also listed under UNESCO as a world-class cultural heritage site. 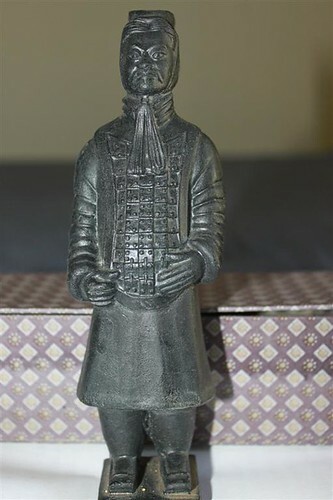 Miniature Terra-cotta Warrior (Middle-Ranking Officer) for souvenir. Kneeling Archer: wears green battle robe covered by armor together with shoulder pieces. The hair was plaited on the back of the head and then coiled into a bun tied with vermilion ribbons. He kneels on the right knee with the left knee raised. The right arm is held with his hand open, the left arm rests on the raised left knee and the hand extends across the chest. The head is held firm and the eyes look directly ahead. The straight back emphasizes the impressions of concentration and discipline. Middle-ranking Officer: wears red trousers and a high-collar robe in green under an armor cape. The collar and cuff were decorated by white and red patterns. Both of his flat hat and square-toed shoes are black. The figure wears chest armor which is fastened by cross-straps on the back over a flared battle robe. High Ranking Officer (General): wears double-layered robes covered by shoulder plates. The figure wears outer robe in dark purple and the robe beneath vermilion. His trousers in green and his square-toed shoes in black. The headgear in brown and the colorful fish-scaled armor protected the chest, back and shoulders. 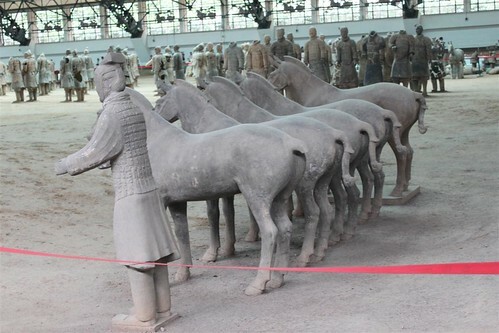 There are 8 knots made of ribbon to decorate the armor, 3 knots on the front plate, 3 on the back and 1 knot on each shoulder. 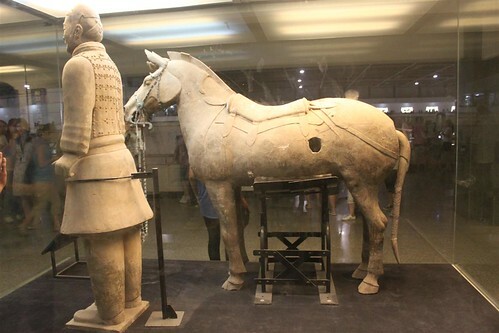 Cavalryman: he's an important element of Emperor Qin's army, providing it with speed and agility. This figure wears the short dark brown tight-fitting armor, green narrow-sleeved knee-length robe with pleats and folds. The small tight-fitting cap fastened under the chin in a reddish brown, suggesting leather. 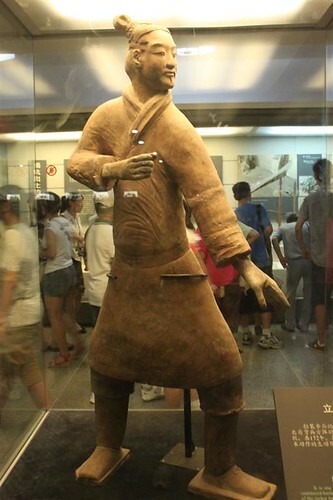 Standing Archer: wears in an unarmored red robe fastened around the waist with a belt, short green trousers, white shin guards and short boots. His hair was coiled into a neat bun on the right top of his head. His feet stand apart with the right foot turned outwards and the left foot forward. His body is tilted to the left with his pendant left arm and raised right arm in front of the chest to hold a crossbow.